Sleep Cycle is an intelligent alarm clock that monitors your movement during sleep using the accelerometer in your iPhone, then finds the optimal time to wake you during a 30-minute window that ends at your set alarm time. 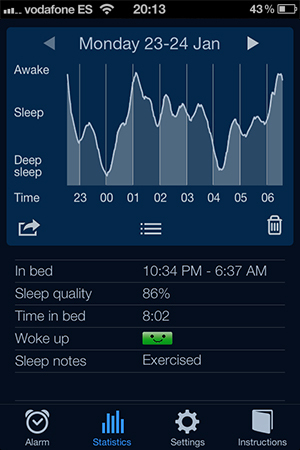 The app also provides detailed sleep statistics and graphs for every night, plus analyzes long-term sleep quality. You also can save notes on how events such as drinking coffee or eating too much affect sleep quality. And you can export sleep data to Excel for detailed analysis. Requires iOS 5.0 or later. Note: Must have ability to charge your phone by the bed and place it according to the instructions.